If you need to make small polygon or shaped holes smaller than one-quarter of an inch, micro rotary broaching may be for you. Rotary broaching tools can be used on with Swiss machine tools and other equipment designed for making small parts. The rotary broaching tool holder is capable of holding 8mm shank broaches, which come in standard hexagon forms as small as .051”. Hexagon broaches smaller than .051” are also available. T10 six lobe broaches with the 8mm shank are also in stock. Even though they are very small, many of the broaches in this size range are available with standard pressure relief holes. In addition to standard hex, square and six lobe forms, custom rotary broaching tools can also be manufactured by Polygon Solutions. These would include double hex, double square, spline and serration forms. 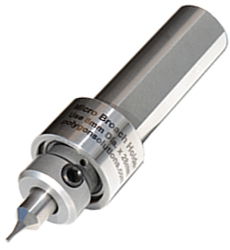 Rotary broaching does have some depth limitations, typically limited to about one and a half times the diameter. However, Polygon Solution’s rotary broaches are designed to reach two times the depth if possible. The rotary broaches also have some manufacturing limitations. The inside radius on a form cannot be smaller than .003” – .005”, and the major diameter of an 8mm shank broach cannot exceed .50”. 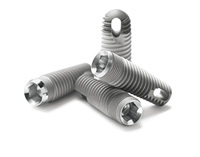 Various materials can be used when micro broaching. Soft steels, brass and aluminum are ideal. However, stronger materials like stainless steel and titanium can also be broached. The resulting finish can be adjusted by optimizing the speed and feed of the tooling. Tool life can also be optimized through various options available from Polygon Solutions, such as coatings, premium broach materials, and custom flat to flat dimensions. Learn more about our Micro Rotary Broach Tool Holder. One year warranty on all GT and Micro Rotary Broach Tool Holders from Polygon Solutions. We are the only company in the rotary broach industry confident enough in our tool holder to offer a full 1 year warranty against bearing failure or other damage.